OMG! 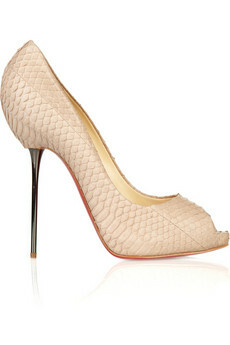 That is all I can say about these Christian Louboutin “Open Lips 120” heels. Incredible. Cream snakeskin and proper stiletto heel. I am in shoe heaven. These will work with your skinny black jeans for Saturday night, with a pencil skirt for work and with a LBD for cocktails. Plus they are “only” £635. What’s not to like? Order your pair from Net A Porter.